I have returned from 17 days in the DPRK. The TGs are in a sad state I am afraid as the electricity is on and the girls are sidelined. The umbrellas are gone. I saw the girls working only about six times in the circles when the power failed. Otherwise they are sidelined or using flags to move traffic away from closed streets. They come in handy when the leadership puts on a parade. They were all at work on National day when Kim Jong-il and Kim Jong-un came out for the crowd. I took many photos that are now on Flickr. I am wondering when the end will come. I think the peak for the Traffic girls was in 2009. The traffic has doubled this year. I was in a traffic jam after the Tajikistan vs DPRK soccer game. I would have never believed it years ago but there is plenty of petrol not only in Pyongyang but more traffic is seen around the country. The photos of the girls should make that clear. This is the state of the traffic girls. Notice how sad she is. Did you see the Kims on national day - did you get any pictures? It's amazing that the umbrellas are gone after all the fanfare they made about installing them. I wonder if they are concerned with demoting the traffic girls, considering how popular they are with foreigners? Probably not, they usually ignore the rest of the world opinion - the whole Juche thing. National Day - We had to leave the hotel earlier than normal and then were taken downtown for a tour of the Flower pavilion. That was interesting but as we wandered by the Taedong we could hear the roar of a crowd. I knew exactly what it was as asked the guides. They would not answer exactly what it was and told us that it was the reserve military people who were invited. 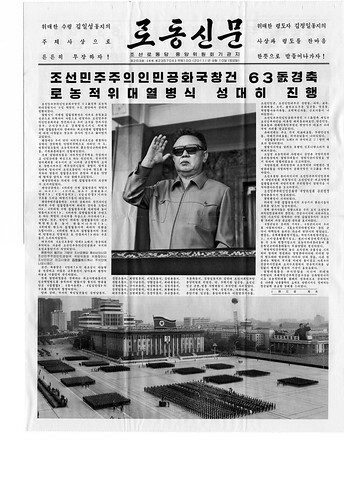 As the roar continued from Kim Il-sung square we knew that both Kim Jong-Il and Kim Jong-un must have been there. As we went to an event at the party monument we could see the people who had been there coming out. They were carrying the artificial flowers on a stick that were held aloft. At that point we wanted anything we could find from the event. I cajoled the guides to get the day's newspapers - something that is not easy and the coverage from the next day's addition. They did that by calling a bookstore and having them held. What I did was buy one for each member of the group and wanted any copies left over that the group did not want. I had to pay one Euro each but it was worth it. This was the same newspaper that was posted in the metro. We watched the metro workers post it and the crowds gather around it. 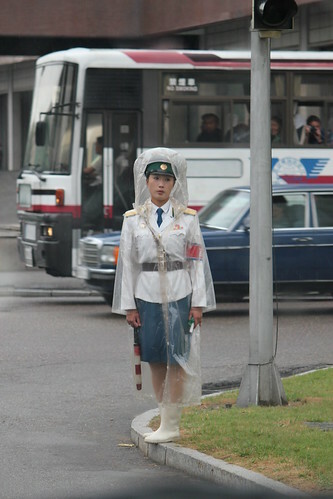 A story about the traffic girls - according to one source it was found that working under the umbrellas was too hot during the summer. I find that hard to believe but it is the kind of story I would expect. The umbrellas were taken away but the problem with that is that the traffic lights are on and the girls are nothing more than crossing guards. They are handy during parades but I am not convinced they are needed. Traffic is up but the lights are more reliable. This time I went all over Pyongyang going into neighborhoods I had never seen. It is universal at every intersection - no umbrellas and no girls in the intersections. That is why the sad girl went up first. Such is the state of the traffic girls. They are on duty but they are not in the intersections. I saw that the girls were working the intersections only about six times during my visit. Last year there were several intersections that were still in use during the 7 - 10pm day. Not now. If we could only get the DPRK to make a statement. They will be around but as traffic safety officers. I wonder how many will be trained in the future. Gah, it wouldn't have hurt to stick you down the bottom there with the TV cameras, eh! Sad stuff regarding the traffic girls, although I guess it was inevitable. I agree, we should write a strongly worded letter, though. You not manage to get close enough for a photo with one yet, or were they still shy? Is it really not allowed to talk with them? Shame, I would invite them over for a beer or 2.